Imagine yourself and your family, forced from your home in the dead of winter, with nothing more than the few supplies you were able to carry amongst yourselves. Then imagine being shuttered into a community center with thousands of other families, displaced from their homes as well, relying on what few supplies the government could provide. Of all the threats your disaster plan should consider, power grid failure is one of the more realistic and among the most likely to occur. When a power grid fails, a substantial geographic area can be without power for hours, days, or sometimes even weeks. What Causes Power Grid Failure? This Is How The Economic Collapse Will Change Your Day-To-Day Life! The two most common causes of power grid failure are system failure and equipment failure, but other events can also wreak havoc. The power grid system may fail due to a disruption of equilibrium in power supplied and power drawn, triggering the line to trip and cutting off the supply of power. System failure was the culprit in Indonesia’s outage as well as in the frequent outages suffered by India. A system failure can occur at the supply-end during extreme weather changes, such as a heat wave that causes an increase in the power drawn from the system to power cooling devices, or at the supplier-end if an error occurs in regulating the power input. An equipment failure can occur at the station, transmission line, or transformer level. Any number of factors can be the cause of an equipment failure, such as an error in the digital processing system or physical damage due to an accident, construction, or weather. Both the 2003 Northeast Blackout and power outages during Hurricane Katrina were caused by equipment failures. Power grid failure can also be the result of malicious or criminal behavior, such as cyber terrorist or infrastructure attacks against a nation or a nuclear electromagnetic pulse (NEMP) designed to disable electronic equipment. In the wake of 9/11, many feared the Northeast Blackout in 2003 was in fact a terrorist attack. Power grids can also fail due to large-scale electromagnetic storms, an electromagnetic pulse (EMP), or a reversal in the Earth’s magnetic field – which can cause temporary disruptions or permanent damage to electronic devices. While events such as these have the potential to completely shut down power systems for an indefinite amount of time, the likelihood of their occurrence – and the extent of ensuing damage – has been hotly debated. What makes cyber unique is the ability for an attacker to overcome the challenges of time, space, and scale.” – Michael Assante, Board Director and Advisor to Council on CyberSecurity, leading expert on energy sector cybersecurity. Cyber attacks against America’s critical infrastructure, including the power grid, are intensifying at an alarming rate. According to the Department of Homeland Security’s Industrial Control Systems Cyber Emergency Response Team (ICS-CERT), from October 2012 to May 2013 there were 200 brute-force cyber attack incidents, surpassing the 198 total attacks in all of fiscal year 2012. Of those 200 attacks, 53% targeted the energy sector with an additional 3% solely targeting the nation’s nuclear sector. The attackers deployed methods as varied as spear-phishing attacks, SQL injections, and watering hole attacks. Continuing cyber intrusions directed against critical infrastructure make evident the imperative for greater cybersecurity. This upsurge of cyber threats aimed at critical infrastructure is one of the most pressing national security challenges facing the nation. What Can I Expect During a Power Grid Failure? The immediate aftermath of a power grid failure is the loss of power, which means modern day methods of communications, sanitation, lighting, cooking, refrigeration / preparation, and transportation will all be unavailable. Within the first few days of a power outage, the disruption in supply of fuel for transportation will lead to shortages in other supplies such as food and medication. Many who wait several days before stockpiling will be greeted with empty and pillaged Supermarket shelves. Don’t rely on any emergency services – medical facilities, emergency responders, and public officials will more than likely be overwhelmed and unavailable. If the outage continues for a week or more, civil unrest will begin to grow as food and other resources become scarce. People will no longer be able to run generators or vehicles as fuel supplies run out, and many will experience a disruption in their finances or incomes. In the event a power outage stretches out into the long-term, such as several weeks or perhaps indefinitely, alternate means of power will need to be found along with long-term solutions to meet everyday needs. You can CLICK HERE to check out a video about what you can expect from a power grid failure. The most basic preparations for a power outage is to have an alternate source of light. Each person should have their own flashlight, it makes sense that everyone will want to see where they are going without having to take turns using the same light. Keeping Cool – Living in the desert keeping cool would be an important consideration, most of our power outages happen during the hottest part of the year. Here are some ways to keep cool. Food Preparation – Pretend that you are camping and cook your food outdoors, it is safer and will help to keep the heat outside. Some things to have on hand for cooking food. I realize that not everyone lives in a hot climate like Arizona. So what are the needs for those living in cold, climates when a power outage hits? Many of our needs are the same, the biggest difference that I can think of is keeping warm in the cold. Keeping Warm – If an outage takes place in the winter you might need to consider how you will stay warm. HOW DO YOU PREPARE FOR A POWER OUTAGE? 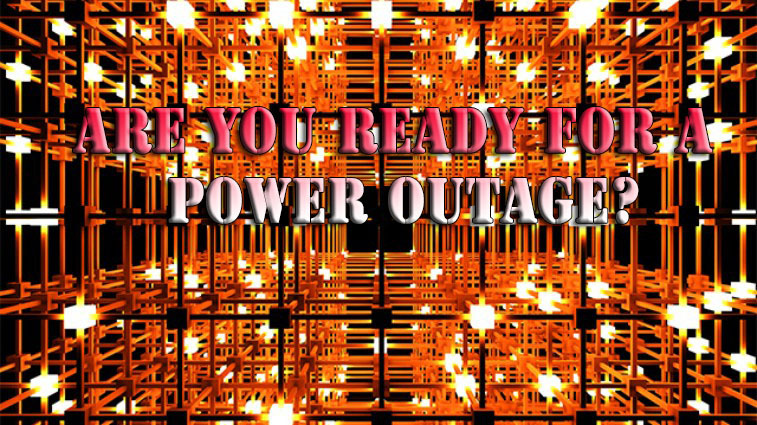 Please let us know what you do to prepare for a power outage in the comments below.